This course is the interactive blueprint and the active ingredient to the law of attraction. Utilization of the coaching course will lend you the tools to be happy healthy and wealthy with peace of mind so that you can live the life you love; which is THE MOST sought after commodity on earth. Did you know that the average human has 50,000 thoughts a day. How many of yours are positive ones? Negative thoughts will yield you a negative life. We believe it is our determined purpose to gather like mined individuals worldwide with the intention of empowering and encouraging; to train and enlighten all in positivity with every aspect of an abundant life and community. It is our belief that by living in positivity ourselves, freely and sharing our resources that we do in fact open a flow of abundance into our lives, which then flows into the lives of others. We believe that by embracing like-minded relationships domestically and globally through word of mouth and social networking, that we open the doors of opportunity to generate worldwide communities and friendships. Our purpose is to create a synergy much greater than ourselves, which will touch and transform the world on person at a time. Together we are building family, synergistic communities and countries having lasting impact for abundant living worldwide. We know that our pure intention effects our rewards in life when we give, invoking the eternal principle of giving and receiving in every aspect of our lives. We believe this is an earth of abundance and that there is more than enough to meet the needs of those upon it. No person should have to go to bed hungry tonight. We believe that by putting action and intention to work on our dreams ideas and true desires, together with the intention and training of living a positively abundant life, magic and miracles happen. By truly embracing the mystery of life, positivity is the key to recreating our world for the better, one person at a time. We believe that every individual has something to contribute to the rest of us, regardless of age, gender race, geographical location, belief or culture. We promise to join together regardless of religious beliefs. The Positivity Factor activates when we are gathering in a circle in a community of positivity. Circles have become a spiritual retreat for many. They are viewed as a way to enhance a healing force by bringing values of relationship, nurturing and the interdependency of a global culture into our conscious awareness and daily practice. Circles come in many forms; from cooking and quilting to sacred drumming and business circles to empowerment groups. All seem to have the same theme; to honor all voices and invite wisdom into the midst. Our circles are Positivity Circles. We come together in circles online, in person, locally or globally. Social media has enabled us to come together where ever we may be or get together when we can. Our sole purpose is to maximize the Universal The Positivity Factor. Our goal is to provide informational and technological systems to assist our members in accessing prosperity in their own life and the lives of others around the world. 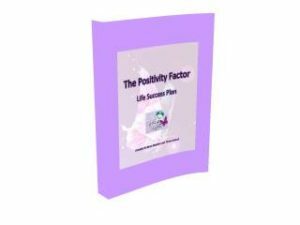 We recognize the “The Positivity Factor” as universal law applicable to all people without exception including race, religion, gender, education, economic status, or geographical location. Our intention is to bridge the separation between races, cultures, religions, etc., to unite with a common cause. This mission is a Global initiative, a world where all come together to embrace positivity as a prosperous community in the teaching and training made available to each and every member.